The only silver lining is that “California’s reservoirs hold more water than they did in 1977, when the state experienced its 4th and 2nd driest years on record from July 1975-June 1977,” the report states. They may be fuller now than back then, but that doesn’t mean they’re all in good shape — as the animation of a dramatically shrinking reservoir at the top of this post dramatizes. I created the animation using Landsat satellite images of New Melones Reservoir in the foothills of the Sierra Nevada mountains west of the Bay Area. The first image was acquired on July 8, 2002. The wet season leading up to summer that year was just slightly drier than normal. Landsat captured the second image in the animation just this past July 10. The difference between a year that was close to normal and now is readily apparent. For a graph showing how much New Melones Reservoir has dropped in elevation over the past two years, please click on the thumbnail above. It was dusk, and there was a good deal of haze in the sky. So the view of New Melones Reservoir was not very clear. That meant I had do some heavy processing, which unavoidably has produced a good deal of digital noise in the photo. Even so, that bathtub ring of light colored ground evident in the photo tells the tale of how much the lake has dropped due to the continuing drought. Unfortunately, the U.S. 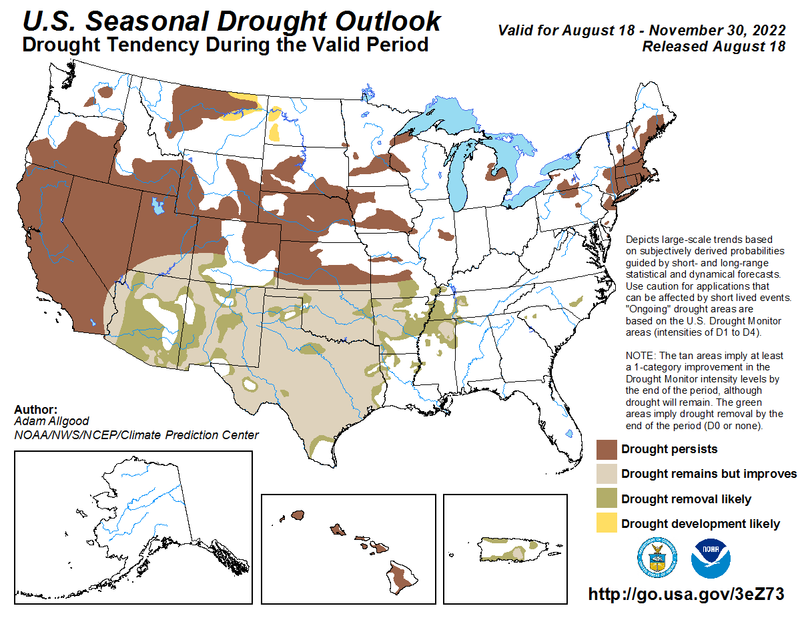 Climate Prediction Center is forecasting that drought conditions will persist or even worsen in California, as well as as in Nevada, and parts of Oregon, Washington, Idaho and Texas, through October 31. In coming weeks I’ll be posting more stories and images of the continuing California drought and its impacts on ecosystems, fire risks, and farmers. So please check back.